This course is developed from a food is medicine perspective with a focus on practical aspects of what patients face day-to-day when trying to make substantive lifestyle changes. The emphasis is on provider education that seeks to incorporate self-care while counseling and empowering patients to make and sustain healthier food choices through shopping and meal preparation. 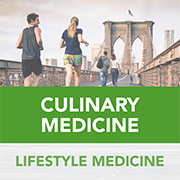 The Introduction to Culinary Medicine will encourage and promote the personal adoption of culinary medicine so that providers are more likely to prescribe the methods to their patients. Comprehensive knowledge of nutrition and the culinary techniques to prepare food that is consistent with low income to moderate budgets, time constraints, and nutritional ideals related to a high fiber plant based diets will be reviewed. This course has a series of additional resources for the learner: (1) Three instructional videos, (2) Three faculty interview videos, and (3) Nine recipes videos. The instructional videos summarize key points that clinicians can learn about home cooking and reinforce with patients during discussions about home cooking. The faculty interview videos are likely to be most helpful to patients who are thinking about home cooking, but have not started. The recipe videos are helpful to patients starting home cooking and needing clear demonstrations. This additional content can be found here and are also referenced throughout the course. Dr. Rani Polak is the founding director of both the Culinary Healthcare Education Fundamentals (CHEF) Coaching program at the Institute of Lifestyle Medicine, Spaulding Rehabilitation Hospital, and the Center of Lifestyle Medicine at Sheba Medical Center, as well as a Research Associate at the Department of PM & R, Harvard Medical School. Dr. Polak’s focus, along with clinical care, is on nutrition education, and on clinical and translational research relating to culinary medicine and medical education. His current work is concentrated on the Culinary Coaching approach, which aims to improve nutrition through culinary training combined with health coaching principles. This approach was used through: 1) Patients CHEF Coaching telemedicine program, aimed at improving eating behavior. This was implemented at HomeBase, Massachusetts General Hospital, Harvard Medical School, and at dozens of practices nationwide, and 2) Clinician CHEF Coaching tele-training program, aimed at training clinicians in how to provide effective Culinary Healthcare Education. This was implemented in the Yale Preventive Medicine/Internal Medicine residency program and was recently approved by Harvard Medical School for Continuing Medical Education credits. Dr. Polak’s work has been featured in many media outlets including Scientific American, Herald Tribute, Jerusalem Post, and USA Today. Dr. Liana Lianov has advanced the lifestyle medicine movement in the US and internationally, including leading the first of its kind intensive lifestyle medicine curriculum by the American College of Preventive Medicine (ACPM) and the American College of Lifestyle Medicine (ACLM). For this work, she received the 2015 ACPM Distinguished Service Award. She is vice-chair of the American Board of Lifestyle Medicine, a past president of ACLM and served on the board of directors of both ACLM and ACPM. During her tenure as the American Medical Association’s Healthy Lifestyles Division Director, she forged initiatives to support physicians in helping patients build healthy habits. Dr. Lianov has recently worked in the private sector to implement innovative strategies for sustainable health behavior change, including emotional well-being programs based on positive psychology and neuroscience. She spearhedaed and is chair of the ACLM Happiness Science and Positive Health Committee, which aims to integrate emotional well-being interventions into health programs to improve outcomes. She is board certified in internal medicine and preventive medicine and completed a psychiatry fellowship. As a public health medical officer for the California Department of Health Care Services, she managed a variety of chronic disease, mental health and prevention programs.